The Tadpole is Frog’s balance bike and is available in three sizes - The Tadpole Mini (£110), the Tadpole (£115) and the Tadpole Plus (£130). These bikes are designed for children aged 1-2, 2-3 and 3-4 years old respectively. The Frog 43 (£240) is the smallest bike in the first pedal bike range. It is a single speed bike, allowing the rider to focus on balance and pedalling. 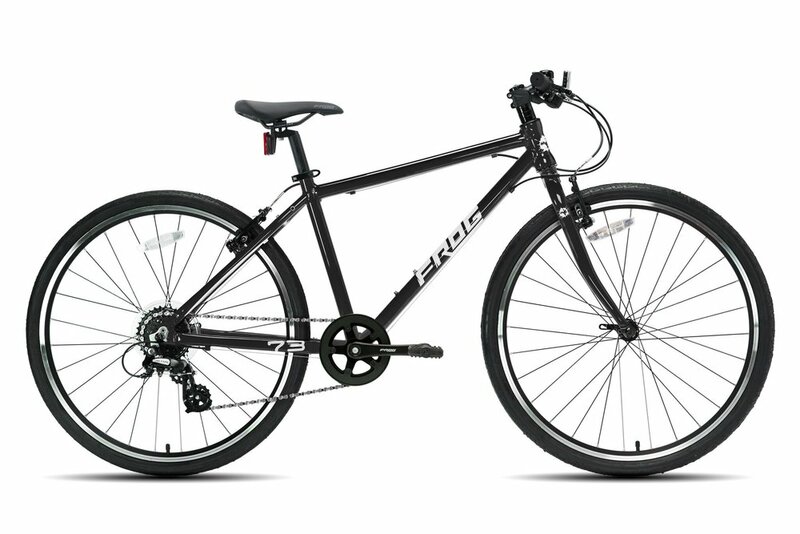 The Frog 48 (£250) is another bike within the first pedal bike range. 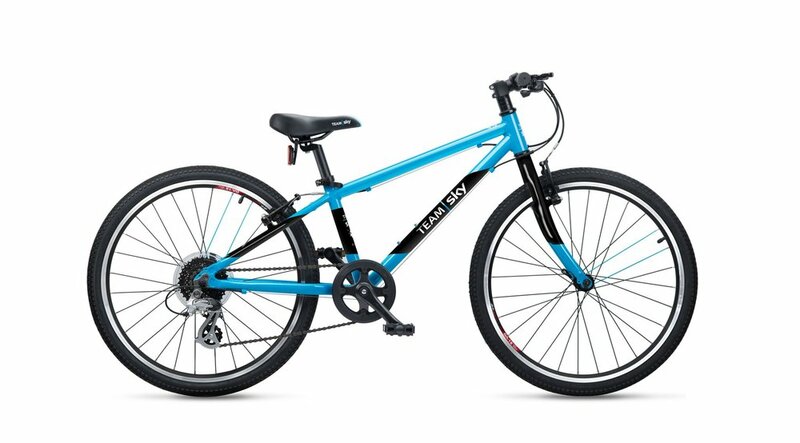 This single speed bike features a safety steering lock to prevent accidents caused by oversteering. 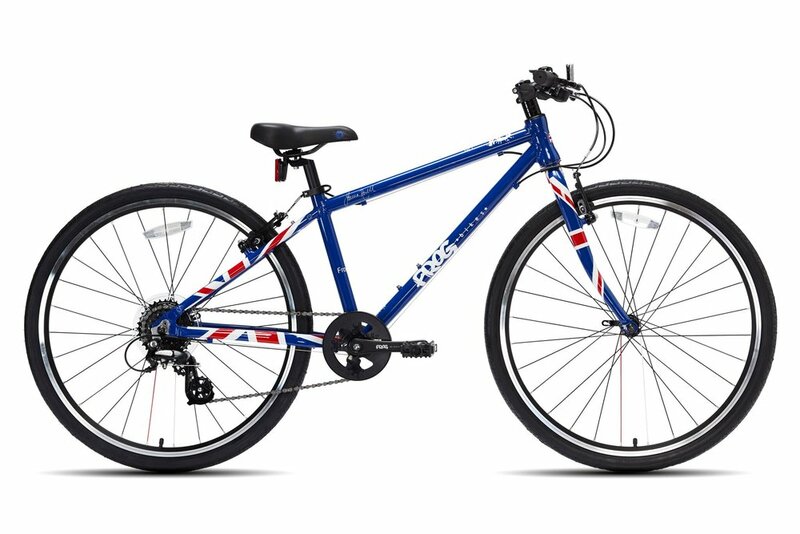 The Frog 52 Single (£280) is a single speed first pedal bike designed for taller riders who are still learning to ride. This bike enables them to gain confidence in the areas of balance and pedalling, without the worry of gears. This is a new edition following our departure at Speeds and we’re sure it’s popular with parents! This version of the Frog 52 is only available in green and red. 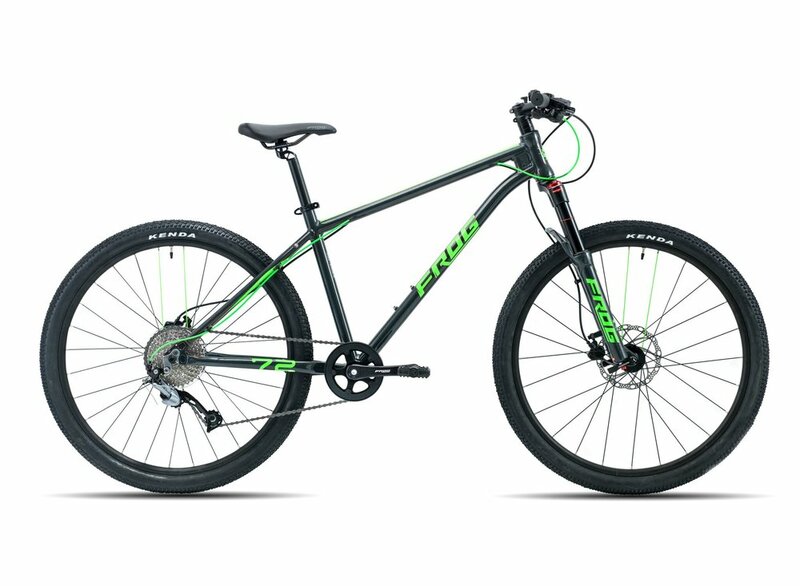 The Frog 52 (original - £300) is the first in the range of geared hybrid bikes. Rapid-fire trigger shifters, which work based on finger and thumb interactions, help children to learn and understand how bike gears work. The Frog 62 (£330) is also available in a number of colourways, including this eye catching Team Sky edition. This bike, with 24” wheels, was also very popular at Speeds! The Frog 73 (£350) is available in fewer colours, but does feature a change to the logo branding to appeal to the older rider. The same logo graphic can be sen on the Frog MTB range. The Frog 55 (£310) was one of the most popular sizes that we sold at Speeds. 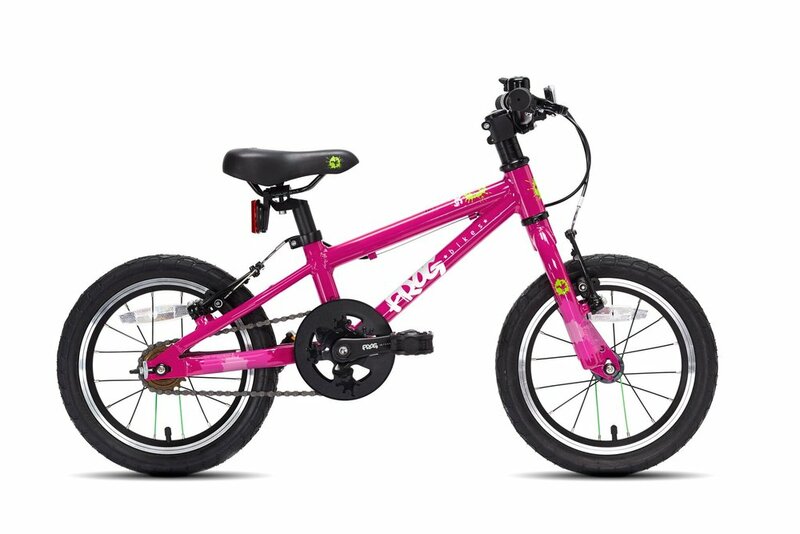 Designed for kids aged between 6 and 7 years old this bike comes in a variety of colours. The Frog 69 (£340) like many of the Frog hybrids, are available in national colour schemes including GBR and USA. 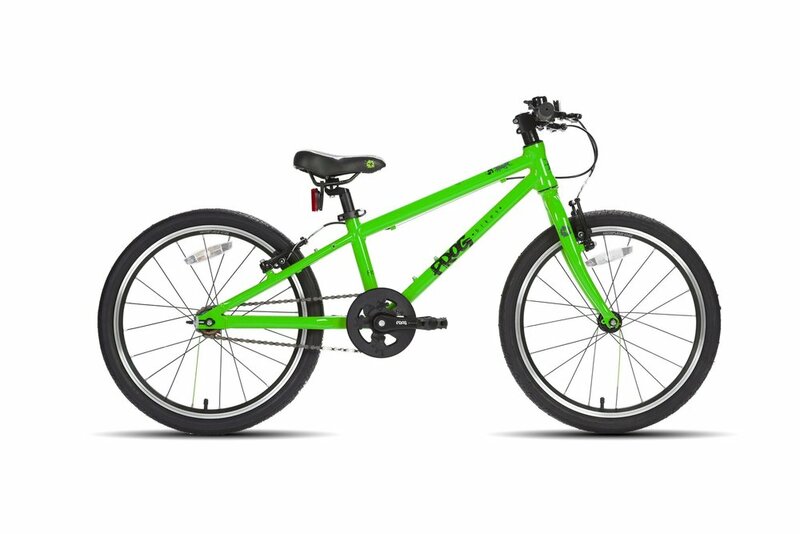 The Frog 78 (£370) is designed for riders aged 13+ and features a 26” wheel - perfect before they jump on an adult bike which has a 700c wheel. The Frog MTB models also very popular. Starting from £590 these are proper kids mountain bikes, perfect for kids who enjoy chasing mum, dad, siblings and friends on the trails. Click the image above to see the different colour options. When Owen and I worked at Speeds Cycles we sold Frog bikes; which were hugely popular with both parents and children alike with their lightweight frames, Shimano components and variety of colour schemes. We’re delighted to announce that we are now a Frog bikes stockist! You can order from Frog’s website directly and have the bike shipped to us (you will pay for the bike upon collection from our workshop). Alternatively, you can order directly from us! Frog’s careful design considerations aren’t just based on colour schemes and model type; but important aspects of a bike, such as the weight of the frame, the length of the cranks, the reach and pull of the levers. All of these things can add up, greatly impacting the experience a child has with a bike. So, what have Frog done to make their bikes so perfectly suitable for kids and why are these things so important? Frog bikes are designed so that a child can easily lift their own bike. We often service kids bikes that are heavier than adult bikes, and this is due to the materials used to be able to sell the bike at a lower price point. Children vary greatly in confidence. Some kids take to cycling like ducks to water, while others are very nervous about riding. Each child takes their own learning curve to the art of riding a bike. A lightweight frame make a confident rider even more assured of their ability. They can get up to speed quickly, decelerate quickly, and manoeuvre the bike comfortably between tight turns. But for a nervous rider, a lightweight frame is even more important. When a heavy bike falls on a child, it makes a stressful situation even more difficult. A heavy bike can be a heavy weight to fall on a little one, making the rider more nervous about getting back on for another go. A lighter bike is a great asset to a nervous rider and helps to form positive rather than negative experiences with cycling. Many kids bikes come with grip shifters fitted. This decision is again made to help keep the point at a certain price point. However, when a child is unfamiliar with how gears work grip shifts can be quite confusing. Because the grip shift appears to be part of the handlebar grip, it’s not always obvious to a child that they had changed gear. As a result, the way a bike behaves might change suddenly and seemingly randomly to a child, making the bike feel unpredictable and making it harder for them to understand how changing a gear affects the bike and the rider. All Frog hybrids come with Rapid-Fire shifters, which require deliberate finger and thumb interaction in order to change gear. Rapid-Fire shifters also make a distinct noise when pressed, and this audible cue helps the child to understand that pressing these buttons will change how quickly they pedal, helping them better interpret how and when to change gears. Furthermore, some children need a very gentle learning curve with gears. Even kids that have had experience with balance bikes might have confidence pedalling quite quickly, but not necessarily with gearing. Frog produce 3 hybrid bikes of different sizes that are single speed, helping the child to gain confidence with pedalling and balance without the worry of learning about gears too! All Frog hybrids and mountain bikes have a single chainring, so children only have to concern themselves with rear gears on a gear bike, again helping them to gain confidence and not over complicating the art of learning to ride a bike! Having greatly considered the aspect of changing gear, Frog have also given great consideration to how children interact with brakes. For little hands, brake levers can feel a stretch too far for their fingertips on some kids bikes. This can impact their ability to brake, which in turn can hinder rather than help their confidence when learning to ride. Frog bikes come with adjustment screws that allow you to alter the reach on the brake levers, making it for little fingers to wrap around the brake levers. As your little one grows and their hands become bigger the reach can be adjusted again to accommodate them as they grow. It’s a little touch that can make a big difference, especially for nervous riders! Crank length is a critical thing to get right on an adult bike, as this dictates the size of the circles that you pedal. Taller riders with longer legs opt for longer cranks, while shorter riders, like myself, notice a world of difference between 165mm and 170mm cranks. So, if crank length makes a difference to adults, it stands to reason that it will also make a big difference to kids. Frog bikes come with crank lengths that are designed with the rider in mind. They are neither too big or too small for the intended rider. Frog’s cranks have been designed and patented following a lot of research and rider feedback! Budget bikes are often fitted with non branded components. The trouble is children are often not the gentlest of riders. In the event that something is broken on a budget bike, like a shifter, or the cranks, or even a wheel, fixing the component or finding a replacement is often difficult. However, Frog bikes come fitted with quality Shimano components that are less likely to fail, that can easily be sourced should they need to be replaced. Furthermore, Frog themselves offer a wide range of accessories and spares, including kickstands, lights, pannier racks, bottle cages, locks, pedals, wheels, stems, forks and much more! This is perfect if, when your child outgrows their bike, you’d like to freshen up some parts in order to improve the resale value. It also offers peace of mind that the bike is easy for yourself a bike a shop to maintain! All of the Frog bikes are finished to an incredibly high standard. The bikes come with some great accessories including a bell, mudguards and reflectors. We’ve previously mentioned that kids are often not the gentlest of riders. While fitting a kickstand can help to reduce scratches when the bike is ‘placed’ on the floor, what can you do as and when your child falls off and scratches the paint work? Well, most Frog bikes come with a little tub of touch up paint and paint plaster to enable parents to quickly resolve minor scuffs! All Frog bikes purchased new will come with a five year warranty on the frame and forks, offering parents peace of mind. In our experience of selling Frog bikes and dealing with Frog, we have seen very few Frog bikes being returned to us for warranty issues. Bikes were returned to us when the young rider had fallen off and parents wanted to replace parts. There were also instances where bikes were returned because they had fallen off car racks or bumped into barriers. In each instance Frog were more than helpful in supplying spare parts and always endeavoured to do all that they could to get the bike back to the child as quickly as possible. Their fantastic warranty and aftercare service was one of the many reasons we decided to stock Frog bikes here at Academy Bikeworks. For many parents, one of their biggest concerns about spending a sum of money on a kids bike is that they will potentially outgrow the bike in 12 months to 3 years. Given that many kids only ride when the weather is good parents might be persuaded to go for something a little lower priced thinking it might be better value for money. However, budget bikes rarely, if ever, hold their value, which means resale is often more difficult. Frog offer the Leapfrog scheme, which enables parents to take their Frog bikes back to participating stores to get a ‘trade in value’ on the bike. The trade in value can then be put towards the purchase of a new Frog bike. This is perfect for parents as they can simply return the Frog bike to the retailer where they made the original bike purchase and walk away with another great quality Frog bike for their child - hassle free! We are pleased to announce that we will be participating in the Leapfrog scheme. You can take a look at some of the bikes on the Leapfrog scheme online. A lot of parents are not cyclists themselves, but they want their child to learn how to ride a bike. As a result, many parents require advice and assistance when picking the right kids bike for their little one. As well as advice on quality and price, a big area where advice is needed is sizing. Many parents think that a bike size is based on age, or wheel size. However, children grow differently; Some children are tall for their age, and some are small. Frog size bikes based on the inside leg measurement of the individual. Frog offer some great simple to follow advice on how to take the inside leg measurement of your child, and how that measurement then translates to their range of bikes. They also include wheel sizing and estimated age range for each bike in a simple chart to make choosing the right bike easier. 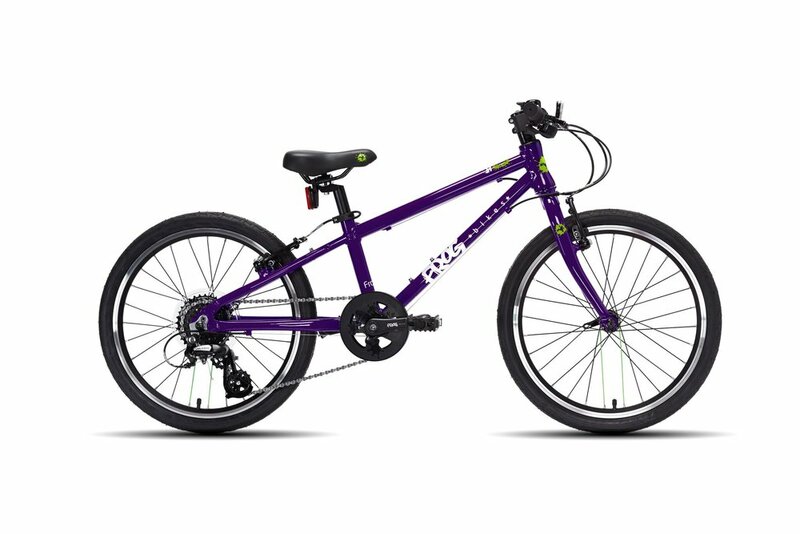 Most Frog bikes (with the exception of the Tadpole balance bike range) come with a number, such as Frog 48, Frog 52, Frog Road 58, Frog Track 67, Frog MTB 69, etc. This number relates to the minimum inside leg measurement (in centimetres) needed to ride the bike. For example, a Frog 48 is designed for 4-5 year olds with a minimum inside leg measurement of 48cms. Usually this bike, with a 9.5” frame size and a 16” wheelset is suitable for children aged between 4 to 5 year olds. Frog bikes come with a long seatpost to help maximise the time your child has with their bike. Other areas of adjustment include fore and aft on the saddle rails, handlebar height and stem length - just like an adults bike. If you’d like any advice on Frog bikes, their sizing and comparative brands please just let us know and we’d be more than happy to help! Please note - all prices quoted here are accurate at the time of writing (November 2018) - Price rises are anticipated for January 2019.